Dan Auerbach is driving through Nashville, looking for a place to get coffee on a Wednesday morning. There are diners and coffee shops all the way down 8th Avenue, but he can’t stop talking about Mas Tacos, a small Mexican joint on the other side of town. He’s been going there for months, drawn back to the place by its spicy chicken soup and no-frills vibe. After sitting at an intersection for a few moments, he swings his BMW in the opposite direction and heads toward the Korean War Veterans Memorial Bridge with the sort of determination normally reserved for his guitar playing. Fifteen minutes later, we’re eating grilled corn and fried avocado tacos long before lunchtime, talking about The Black Keys’ new record, El Camino, which is set to be released this December. It’s important for Auerbach to do things like this – to wake up in his own bed, make loose plans for coffee and wind up at a hole-in-the-wall taco stand instead. In a few months, he’ll be back on the road with Patrick Carney, his bandmate for the past decade, to promote what may be the group’s best album yet. The guys normally try to hold themselves to the golden rule of touring – no more than three weeks on the road without a two-week break – but they broke it several times during the Brothers tour, and chances are they’ll break it again. If there was ever a time to enjoy the little things in life, like eating chicken soup at 10:30 in the morning, it’s now. While we eat, Auerbach doesn’t attract a single glance from anyone inside the restaurant except the cashier, who only seems to recognize him as a regular customer. Maybe Nashville itself – a place where celebrity sightings are as common as cowboy boots – allows guys like Dan Auerbach to drift through town without being bothered. Still, there’s something special about The Black Keys’ ability to keep a low profile, even with Brothers inching its way toward platinum status. “It just passed 830,000 copies,” he clarifies. Years ago, he wouldn’t have kept this sort of statistic filed away. Then again, Auerbach – who, after our meal is finished, drives us back to his Nashville studio in a BMW, spending the entire trip blasting songs on a sound system that can only be described as very, very nice – has come a long way since cutting his teeth in the sports bars of Akron, Ohio. The two ran with different crowds at Firestone High School, where Chrissie Hynde and Joseph Arthur once attended classes. Auerbach listened to rap music and captained the soccer team. Carney, the class clown, collected Sonic Youth records and played in rock bands with names like Umbilical Whored. 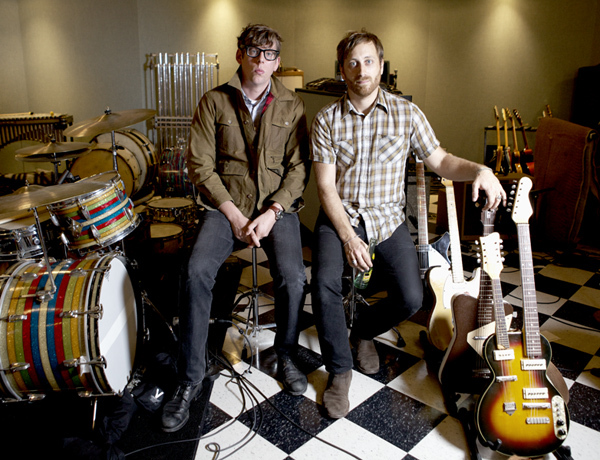 The Black Keys didn’t form until a few years after graduation, when both members found themselves kicking through town after dropping out of college. As the story goes, Auerbach – who realized he couldn’t get gigs in other cities without a proper demo – asked Carney to help him record some songs. Auerbach would supply the band; Carney would supply the recording equipment. They hatched plans to track the songs in Carney’s basement. When the day arrived, though, Auerbach’s backup band was nowhere to be found. He ended up jamming with Carney instead, sparking a series of rehearsals that eventually resulted in the duo’s first recording: a rough, six-song demo composed of “old blues rip-offs and words made up on the spot.” They pressed some copies, solicited artwork from Patrick’s younger brother and mailed packages to a dozen labels. Alive, a small indie imprint operating out of L.A., wrote back, offering the guys a record deal before they’d even played their first show.